Are you seeking an unique wedding? Perhaps something small and intimate, yet truly spectacular? Consider a wedding aboard the classic 1938 sailing yacht JADA. We can make your wedding truly special. 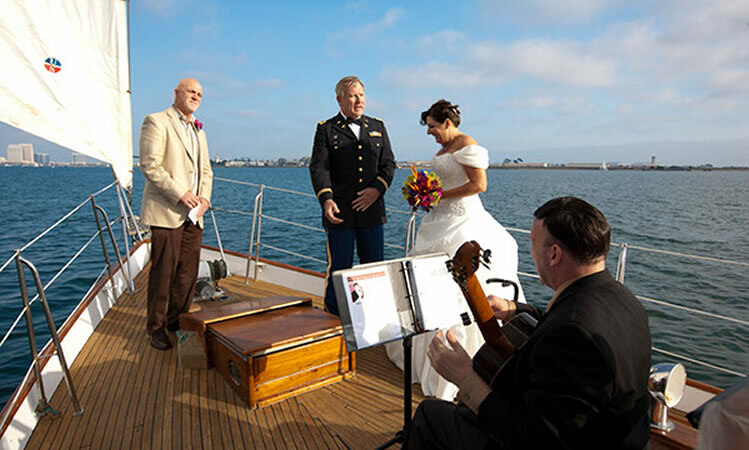 Imagine a beautiful afternoon sail on San Diego Bay, with your friends and family aboard to honor and celebrate your wedding. Perhaps a morning sail to Glorietta Bay for a wedding with the Hotel del Coronado in the back ground. Or perhaps a sunset sail? What a wonderful picture of the two of you on a classic sailing yacht with the skies turning red, orange and gold in the background. The perfect lighting for your perfect pictures. Or perhaps you are thinking of a unique way to depart the wedding dinner? We can pick you up at dozens of locations on San Diego Bay, and sail you to your honeymoon suite. Imagine all your friends and family on the dock as you board JADA and sail off into the sunset. Enjoy a glass of champagne as you sail off to begin your life together. We are also available to do wedding photo shoots at the dock or underway. Hors d’oeuvres and special cocktails available at your request. Please call Carole to 858-222-9479 to make all the arrangements. 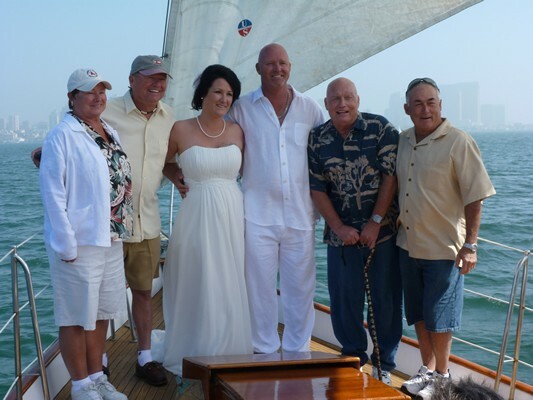 Click here for a San Diego wedding charter quote.